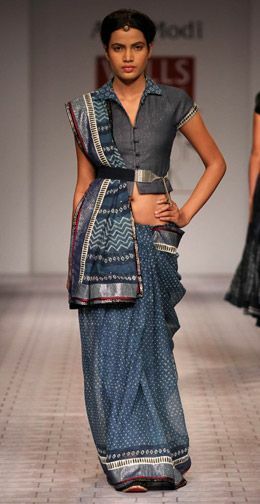 I am very obsessed with the idea of reinventing and modernizing traditional weaves. Blame it on the style diva Sonam kapoor for giving me these very unconventional ideas to look all fashion forward in indian wear. Sonam really nails all her looks and brings in a trendy different touch to her outfit . The six yard saree is very versatile indian piece of clothing and can be styled in thousand different ways if not more. 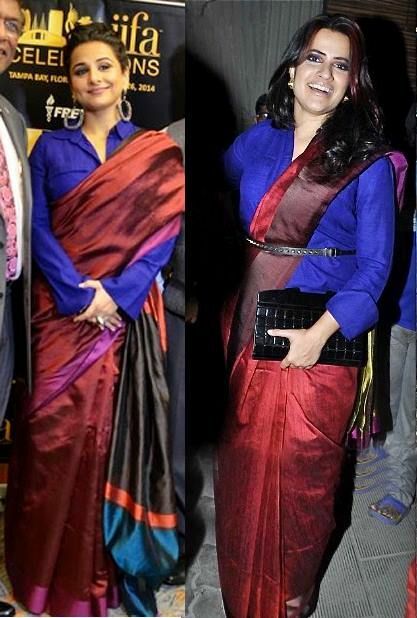 Many indian celebrities have been turning up in contemporary versions of the saree and turning eyes. 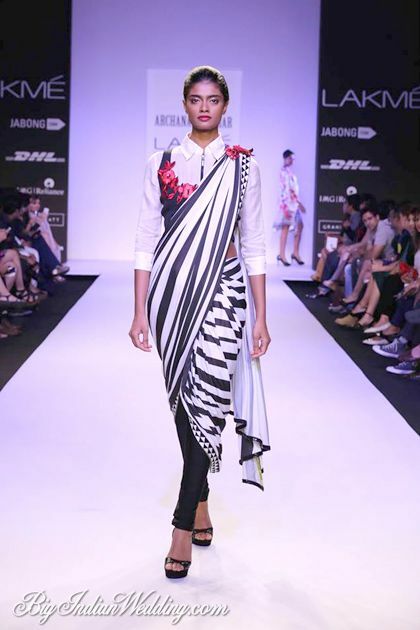 There is offbeat masaba prints, different drapes and westernised louses. Pairing a saree with a t shirt has been quiet a hit with B town celebs being done a lot of times mostly for film promotions. Here lets talk pairing a shirt with saree. 'Shirting the saree' if you want to call it that is an interesting way to wear the traditional sari for an edgy glam look. 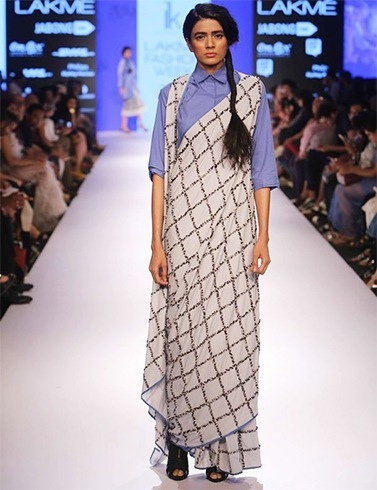 This idea was sparked off on fashion week runway by designers like Payal khadwala, Satya paul and Ilk. 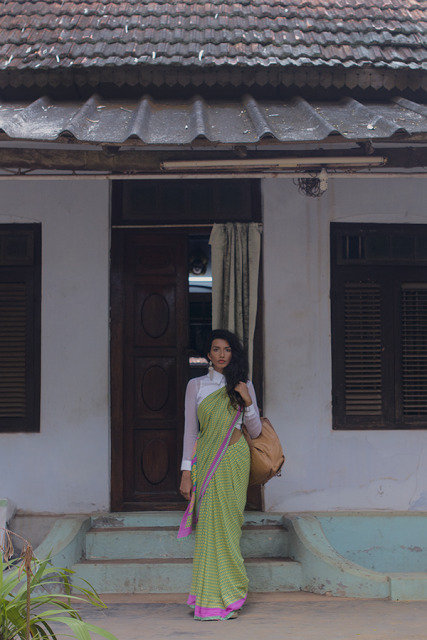 A shirt paired with saree can easily be worn to work or even as festive with right styling. 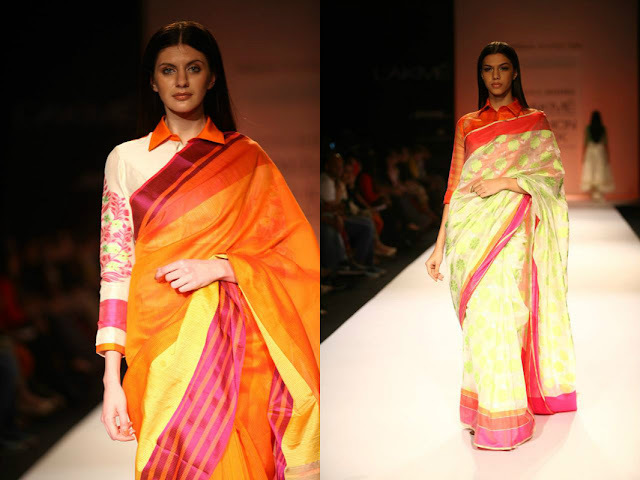 Pair your bright shirts or printed ones with earthy or silk sarees for a contemporary festive look. This look is super chic and works best foe festivals or weddings in winter. Since there is so much colour splash keep the styling and accessories minimal and finish off with subtle makeup. A crisp white shirt is all it takes to quirk up your neon saree. This look is very easy to replicate and looks effortless too. Pair your checkered shirt with a polka dotted or plain saree of same colour family for chic office wear. You can even try color blocking for work, pair a crisp plain shirt . 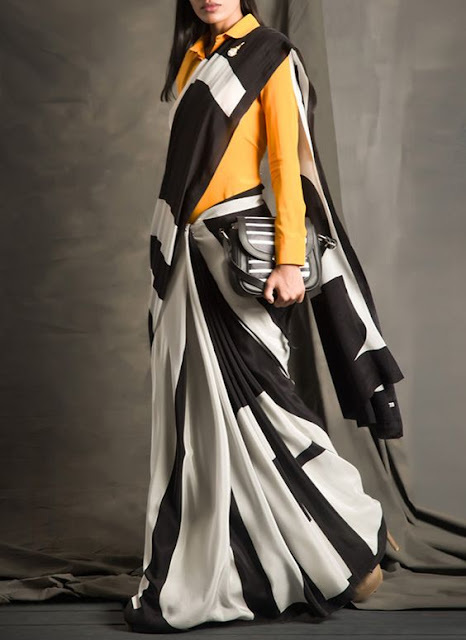 For a playful fun look try colorblocking a saree with a sleeveless shirt, This look works well for a mehndi ceremony or a brunch with friends. 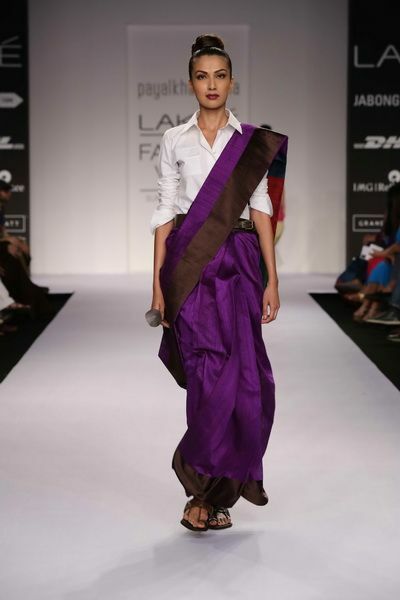 The dhoti saree is in trend and you could give this trend a try with a shirt blouse too. a very hatke drape . Try it. 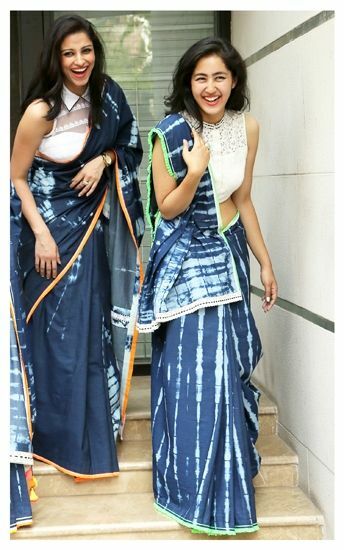 A lot of women are going in for unconventional drapes for the saree these days and if you are one of them try a plain shirt with an unconventional drape like a suspender saree, belt saree or cross wrap. 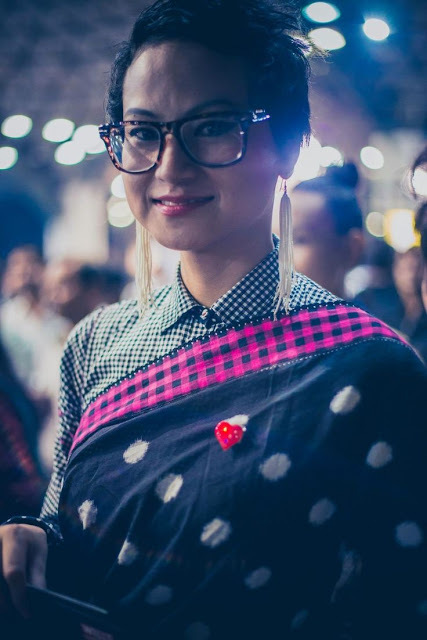 Would you pair a shirt with a saree? If yes then where would you wear such a look? Tell me! shirt style blouse looks cool yet formal.. love this style!! Awesome saari collection and fashionable dresses .I love all !!  Women outfits with shirt combination are awesome and interesting look. I love this type of look !! so thanks for posting this information. buy printed sarees online at affordable price with us ..